The holidays are truly the best and worst time for me to host my friends. I love being able to surround myself with my loved ones and create a Jewish experience that is meaningful for all of us. As much as I find joy in fostering this environment, I get so stressed out because there never seems to be time to cook all the food, order all the materials, and straighten up my home to host. Insert a Jewish superhero (said superhero is me) that has arrived to save the day! Check out my 8 Hanukkah Hacks to make your hosting lives a little bit easier this holiday season. Sufganiyot…I mean who doesn’t love a freshly fried doughnut?! I do get nervous about leaving my apartment smelling like a Krispy Kreme for three weeks though and I am sure I am not alone. This Hanukkah, go to your favorite local doughnut shop to purchase a dozen plain or glazed and go to your grocery store to pick up a jar of your favorite jam. 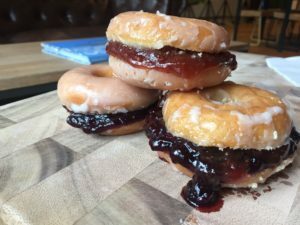 Slice those doughnuts in half and spread the jam inside for a gourmet sufganiyot that is ready in 30 seconds! Tip from Terry: Fill one donut with something weird (relish? Mayo? BBQ SAUCE??) and see which friend bites into it. Then laugh. In need of some themed jams at your program? Check out Spotify’s Hanukkah playlist! Lighting the candles is a meaningful experience, but Hanukkiot can be pretty pricey to purchase. 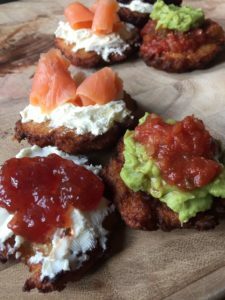 Kveller has three inexpensive hannukiot for you to make at home on a budget. If you’re feeling ambitious, gathering together to make these hannukiot can be an MHWOW program for your community. The options are truly endless! If you want to refresh your guests about what the story of Hanukkah is, History.com has a great summary on their website to use as reference. I love a good competition and if you do too you can encourage your guests to participate in an ugly sweater contest! Several companies make Hanukkah sweaters now so we can all dress to the nines. Check out Tipsy Elves for some personal favorites of mine! One thing no one wants after a holiday celebration? Leftover Manischewitz wine! 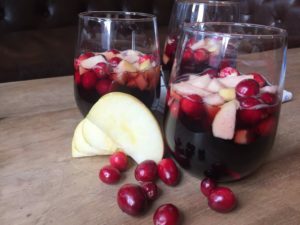 Follow this recipe for the perfect bottle of Manischewitz turned sangria, but also feel free to use any bottle of wine (seriously ANY bottle of wine is probably better). Sangria is also one of those things where you can dump all the ingredients in a pitcher and it’s done. Do you need Hanukkah starter kit and don’t have time to rush to the store? In one click you can purchase all the essentials you’ll need to celebrate Hanukkah this season using this Amazon shopping list! From chocolate gelt to a cookbook and candles to matches, you will be all set to go.